What do you get when you put hundreds of tech-minded students in a room for 24 caffeine-fueled hours? Apps. Lots of them. 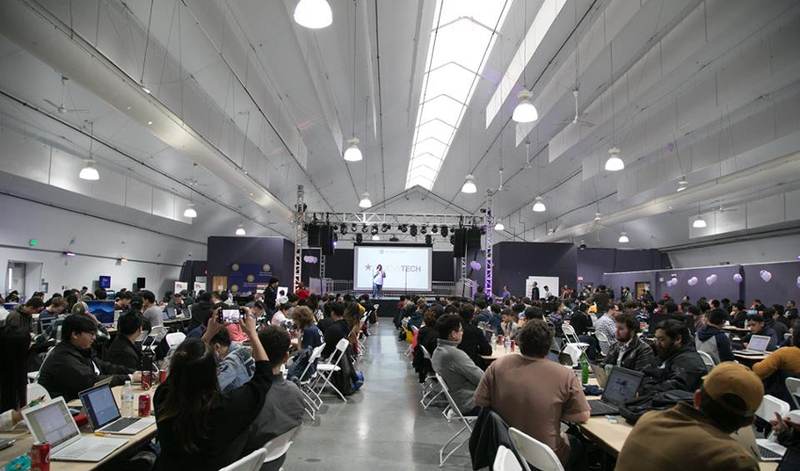 Saturday, March 2, marked the start of San Francisco State University’s third annual SF Hacks, a student-run “hackathon” where teams competed to put together fully functioning websites, mobile apps and more over a 24-hour time period. SF Hacks is the largest university hackathon in San Francisco, and this year’s was the best-attended yet, drawing over 450 student competitors from across the country and Canada to SF State’s Student Life Events Center. The creations of hackathon competitors are pieced together from pre-existing packages of software (or “hacked” together, an act that gives the competition its name). In SF Hacks, those building blocks were provided by companies like Google, Lyft and text-messaging platform Twilio, all of which were among the sponsors of the event alongside SF State’s College of Science & Engineering and the College of Business. The grand prize went to an SF State team for their app Twiggle. A creative combination of code from Google and Twilio, the app allowed users to search the internet using text messages in the absence of Wi-Fi. Other top-placing entries included everything from an image-analyzing tool to help doctors make diagnoses to an app that made use of speech-to-text software to streamline classroom notetaking for deaf and hard-of-hearing students. The high-octane competition put several kinds of creativity on display. Software-minded students conjured apps out of code while business majors helped plan and execute the projects, and on some teams communications students gave the creations some visual polish. By Sunday afternoon, each team was able to show off a finished product. Schmoll, Swanson and a team of six other SF State students handled all of the logistics for SF Hacks, from securing a venue to fundraising for a five-figure budget and feeding hundreds of competitors. As an added bonus, sponsoring organizations put on workshops during the competition, including a web development lesson from Macy’s employees and a Google interviewing prep workshop.